What a delight! 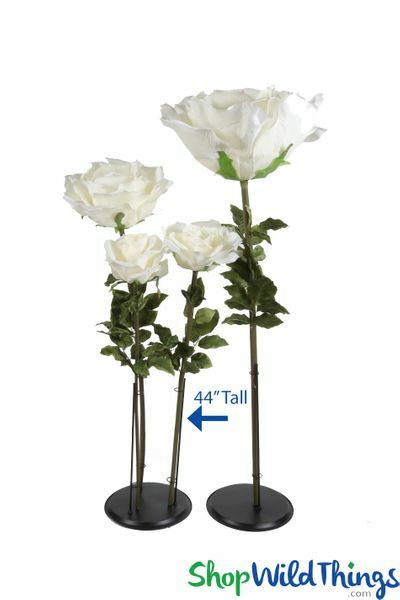 We're so pleased to present our Long Stemmed Ivory Silk Rose Bloom that stands 44" tall (that's 3' 8")! The gorgeous jumbo bloom measures 14" wide by 6" tall and the silky sheen and details on this flower are luscious! The enormous petals surround the center bud which hasn't fully bloomed. The stem is 3/4" thick and consists of a sturdy pole covered in a heavy duty matte green coating. 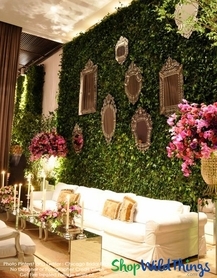 The stem has sprouts of large bendable silk leaves, detailed with veins and a multi-green effect. The top of the stem has a screw where the rose head attaches. So now this lovely becomes a multi-functioning accent piece as a full flower with stem, or unscrew the head and the flower sits upright all by itself! This is perfect for Alice in Wonderland themed parties or as a photo prop and it only weighs 13 oz. 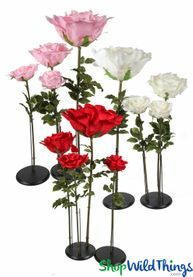 Create a stunning visual masterpiece by displaying in our single stem or Multi-Stem Metal Flower Holder, specifically designed to securely hold 3 of these awesome flowers! 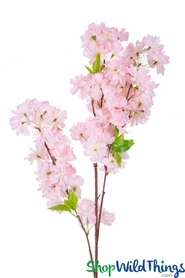 We also have this 44" tall size in red and pink and we have 3 shorter sizes of ivory roses. The stand is the perfect way to display large d�cor with a minimal space footprint. 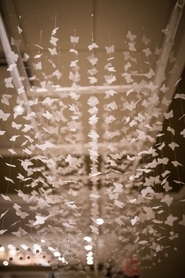 Add on some Butterfly Garlands and have a joyous, celebrate spring party! If your event calls for memorable table centerpieces, then simply unscrew the head from the stem and place on the table! The washer on the bottom of the rose keeps it sitting upright, creating quite an impressive table display and this flat bottom also means you can mount this bloom to a wall, ceiling or any flat surface! The deep petals are a perfect spot to conceal fairy string lights or Glowing Firefly Pearls which will add another enchanting dimension!